Wondering which features to invest your time and effort in? While there have been recent changes to Google+, the platform has a number of features many marketers love and will continue to use. If you have been using other social networks in favor of Google Plus, your business could be missing out on some very important benefits. In the last few years the network has undergone some major updates including the way it helps businesses connect with customers and prospects. This guide will give you a quick primer on everything you need to know about Google Plus and how to put it to work for your brand. Why Google Plus for business? If you’re hoping to make your company more discoverable (and easy to locate geographically) Google has handed you the tools you need on a silver platter. Websites that appear on the first page of Google get 54.8 percent of all clicks from users. Google My Business is by far the most important Google+ feature, especially if your business has a local presence. Not only can a Google+ business listing increase your visibility on local and mobile search, but it also allows potential customers to call you, get directions to your business on Google Maps and check out your verified business website. Your listing also makes your photos and YouTube videos easily findable on your business page and lets customers leave reviews for your business right on your Google+ page. It’s up to you to fill in your business information with as much detail as possible. As mobile search grows in importance, having a Google+ business listing will become even more vital from a local SEO point of view. 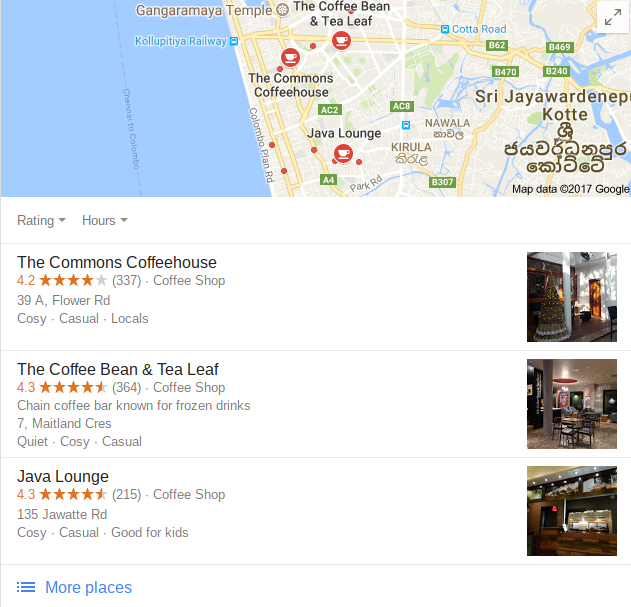 If your business is a retail store, restaurant, café or hotel, your Google+ business listing will be a crucial part of your online presence in the years to come. Google+ Circles are an effective way to create subsets of people you’re connected to and share content and updates selectively with them. You can create circles based on friends, customers, business partners, affiliates or influencers you follow. This helps you segment your updates to particular audiences and their interests. Create circles for different groups of people to tailor your updates. Some people even use circles to send updates to large groups to avoid the restrictions that come with Gmail. Google+ Communities enable you to organize groups of people around a topic of conversation or a cause. You can use communities to recruit and connect with passionate advocates of your products or your cause. Google+ Collections are a unique way to group your posts by topic. This feature allows you to categorize the content you share on Google+. Lately Google seems to have been adding features to make it easier to add posts to a collection, and they seem to be expending some effort on adding other bells and whistles. According to Google, “Posts in collections you follow will appear in your Home stream, with a link to easily jump right into the collection so you can get to similar content from that author.” Ever since I started creating collections, I’ve noticed that Google+ users have been finding and following them without any effort on my part ". You can create collections of product photos for your business, or if you’re a non-profit, you can create collections for your campaigns. Since it was first released, Google+ Hangouts has become one of the platform’s most popular tools. Hangouts are used by businesspeople and anyone who wants to connect to an audience in a more intimate and authentic fashion. 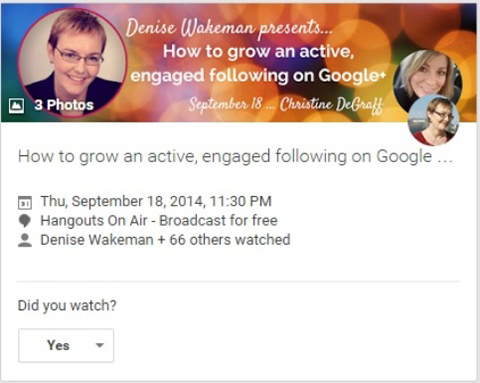 Google+ Hangouts are a great way to connect with your audience. For your business, hangouts are a great way to create and promote events, such as product or book launches, Q&A sessions, webinars or conversations on a topic of interest to your audience. You can also use them for videoconferencing to connect to people across the world. Hangouts are a fantastic way to grow your audience and engage with them on social media. Hangouts and Hangouts on Air have helped Google hit the jackpot as far as popularity is concerned. Their use will only grow as mobile video becomes all the rage and people find more ways to use the tools to promote your business. 1. It’s good for Google SEO – Google may officially deny that social signals are used for rankings (and that includes their social network as well) but in my opinion the more information they have about a webpage (especially about businesses that sell online), the better is for that business because it helps in establishing trust which is one of the factors why a website may rank better than others. 2. It’s good for local SEO – Local businesses have many more reasons to use Google+ since it’s a great way to provide Google with more details about your local business such as location, contact details, services offered etc. When you do everything correctly your will get a nice snippet with information about your business on the right side of Google when someone searches for your business name. 3. It’s good for your adwords campaigns – When you run campaigns on adwords and you have a Google plus business page with more than 100 followers and updated content, adwords may show your number of followers and +1s in your ad and this will drive more interaction and attention. 4. It’s good for your brand and online reputation – Businesses that do not fall in the category of local businesses i.e. they do not serve customers in a physical location are considered as brands. Brands can also get their company information in the right hand of Google if they have a Google+ Business page with more than 1000 followers that is updated with high quality posts related to their niche. 5. It gives you the ability to explore new advertising options – Businesses with more than 1000 followers can also take advantage of +Post Ads, promote hangouts on air and automatic posts.